Medical Alert System Reviews - Is it a Scam or Legit? 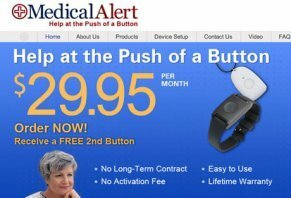 The “As Seen on TV” Medical Alert System claims to provide you with “help at the push of a button,” which can give you a “renewed feeling of independence and safety.” The company claims to have sold more than 150,000 Medical Alert Systems, and to be recognized by the Arthritis Foundation and Good Housekeeping. Medical Alert System is owned by Connect America, based out of Broomall, Pennsylvania. The company holds an A+ rating with the Better Business Bureau, based on nearly 170 closed complaints over the past three years. Regarding their service, the most common complaints we encountered during our research included billing issues, hard-selling tactics, and persistent sales calls after a system has been purchased. With that said, the company does appear to address complaints quickly. Maintain your independence, while remaining in your home. Receive help with just a push of a button. Gain 24/7 peace of mind. Regardless of where you live, Medical Alert Systems are easy to use, and can provide support using “interactive two-way technology.” This is accomplished using short-ranged wireless devices that connect you directly to a UL accredited monitoring center. When pressed, your waterproof button will allow you to communicate with the speaker box base unit attached to your phone, which connects to a 24/7 support center via a phone jack or Voice Over Internet Protocol (VOIP). Base Unit – Features two-way voice communication via speakerphone, Emergency, Home, and Clear buttons, and up a 32-hour backup. Long Range "Medical Alert Pendant" Transmitter – A battery-powered miniature transmitter that works directly with the base station. Features a breakaway lanyard, and an automatic status test every two hours. Long Range "Medical Alert Wristwatch" Transmitter – Like the Pendant, this transmitter is small and waterproof, but can be worn around your wrist. If you want all the convenience of the Medical Alert Home System, but live an active life and need professional monitoring wherever you go, the Medical Alert Mobile System might be a good choice. Instead of being tied to a landline, this system uses GPS technology to send your coordinates to a Response Center, who can then dispatch help to wherever you’re located. Push your button for help. You unique digital ID and location information are sent to the Response Center. A Team Member initiates two-way communication with you. Your Team Member will then contact help, whether that means your neighbor or emergency services. Though you don’t need to be near a phone to use the Medical Alert Home System, you will need to have an active phone line. Simply “plug in the base unit to a phone jack and power outlet,” and out on your pendant or wristband-style alert button. Handheld mobile device and charging cradle. While there are no long-term contracts, hidden charges, or activation fees, you will have to sign a Monitoring Agreement and make a deposit equal to three months of service (e.g. $89.85 for the Home System, and $119.85 for the Mobile System) to begin service. At the end of this three-month period, you can cancel your Medical Alert System without further obligation with a 30-day advance notice. Also, all Medical Alert Systems come with a lifetime warranty. Keep in mind that as soon as you place your order, you’ll likely start receiving telemarketing calls from Connect America. During our research, we read numerous complaints about persistent calls, even long after a purchase had been completed. To cancel your service or opt out of sales calls, you’ll need to contact customer service at 800-800-2537. Claims to provide you with a feeling of independence and safety by connecting you to a UL certified facility. No long-term contracts or expensive fees. Two different models to choose from. Mobile System requires AT&T cell phone coverage. “As Seen on TV” product, which often carry lower customer satisfaction ratings. While the Medical Alert System does appear to have a primarily positive online reputation, the most common complaints we encountered included billing issues, hard-selling tactics, and persistent sales calls after a system has been purchased. With this said, the company does appear to rectify these complaints quickly. Next, according to the company’s website, “the Response Center employs staff who are native speakers of languages other than English,” though they are claimed to be US-based. Because of this, keep in mind there may be a language barrier at times, which might be disconcerting during an emergency. Finally, Medical Alert System was sued in 2013 for “impersonating Life Alert through fraudulent “robo-calls” and other telemarketing to obtain new customers.” However, the company later issued their own warning that they were victims of the same crime. Unable to return, auto billing and they keep taking my money. My mom no longer needs unit Medical Alert, they were notified 60 days ago yet, the auto billing keeps taking money from my mom's account. I'm unable to talk to a live customer service person and they don't respond to my email. Beware - save yourself from stress! This company is very dishonest; there have been some changes! After several years of service, I must cancel my Mother's account due to the random and strange over-billing amounts on auto pay, and a rude billing department that is totally evil. Someone by the name of Sheila is very deceptive and has tried to assist in over-billing my Mother the last two years. Purchased and set up for peace of mind? Instead, I've had to be concerned with them trying to take financial advantage of my elderly Mother. My 90-year-old,o recently widowed mother needed some type of medical supervision in case of an emergency. She lives alone, and I live four hours from her. We had problems from the beginning (that should have been a warning for us). They lied and sent someone to her home to install the unit, and she was not living there yet. Said they had talked to someone and confirmed the appointment. I explained that was impossible since no one was living at the house. But we went through with it anyway. Every time we tried to call them to get the equipment installed it involved an hour on the phone talking to three different departments. Several times I told them we were not happy with the service. Recently, ALL service was lost on a Saturday afternoon. Equipment continuously yelling "please wait, please wait." My mom tried to contact the medic alert number and no one was able to turn it off. I tried to tell her it was her landline causing the problem, or the battery was dead. No one could solve the problem. Finally, she was told to call this person back on Monday at 1:00 pm. When she called back, she got a different person who had no idea what the history was, wanted her (at 90 years old) to reset the equipment again, which she did again with no results. Finally, she was told they would need to send her a new unit, which she would receive on Wednesday. She has now been without service for six days! When I called to see what the story was, they told me (after speaking to three different, not friendly service departments) she was sent a cellular unit and had lost the cell tower signal, and they were now sending her a system for her landline. She lives in the middle of nowhere, and I asked if it would be installed immediately and they said they have to wait until it is received and then set up the installation. I asked if we would be reimbursed for the missed days and had to speak to another department who said when the equipment was installed to call back and they would determine who many days to reimburse us for. NOW they tell her she has to pay another $50 to install the new equipment. We were not told that because they installed the wrong equipment we would have to pay a second installation fee. This was the WORSE company we have ever dealt with. They are very nasty on the phone. They told me that they have walked my mother through how to install it several times and she hasn't been able to do it. The box has never been opened for fear they would accuse her of damaging it. How many of their 90-year-old customers install their own equipment? I have no idea how they ever received a high rating. Consumers beware of this company. I was not called by the company itself, rather later I found out they were lying about where they were calling from. I tried to call the number they gave me. It was no longer in use. Write a Review for Medical Alert System!